In the cockpit, the pilot, Tammie Jo Shults, a veteran Navy pilot, flew on with one engine and calmly radioed air traffic controllers in Philadelphia to discuss her approach. She told them the flight was carrying injured passengers and needed emergency medics on the ground. “Is your airplane physically on fire?” an air traffic controller asked Ms. Shults, according to audio captured by LiveATC. 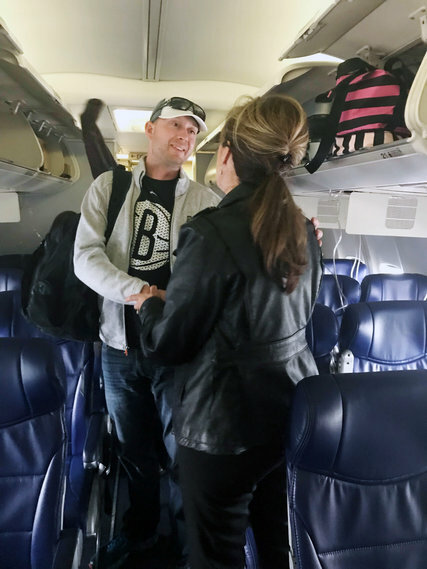 Timothy C. Bourman, a passenger and pastor, spoke with Tammie Jo Shults, the flight captain, after an emergency landing in Philadelphia. On Wednesday, Robert L. Sumwalt, the chairman of the National Transportation Safety Board, said there was evidence of metal fatigue on the left engine of the plane, a two-engine Boeing 737. Mr. Sumwalt also said that investigators had discovered that a fan blade was missing from the plane’s other engine. Robert W. Mann, an airline analyst, said this kind of metal fatigue is virtually impossible to see until a failure has already occurred. It is always destructive when a blade comes loose, although it is unusual for uncontained engine failures to be deadly, he said. On Tuesday morning, as the flight descended toward Philadelphia, some passengers scrambled to put on oxygen masks while others hurried to buy internet access so they could send a last message to their children and families. Marty Martinez, 29, of Dallas, held a yellow oxygen mask to his face as he live-streamed the descent on Facebook. “It appears we are going down!” he wrote. We are going to try to land. Tell the girls we love them and that Jesus is with them always. On the right side of the plane, just across from the blown-out window, Sheri Sears said her friend and travel companion, Tim McGinty, reassured his wife and Ms. Sears that they would be fine, and tightened their seatbelts. Then he sprang up to help drag the injured passenger, Jennifer Riordan, back into the plane. Ms. Riordan was unconscious and bleeding as Mr. McGinty and another passenger, a firefighter from north of Dallas, laid her across a row of seats. A retired nurse rushed up and helped Mr. McGinty perform CPR all the way to Philadelphia, but it was no use. Ms. Riordan, a Wells Fargo executive and mother of two from Albuquerque, was pronounced dead at a hospital. As the passengers tried to save Ms. Riordan, Ms. Sears thought about her 11-year-old daughter, Tyley. Ms. Sears’s own father had died when she was 7, and she kept thinking to herself: I’m not going to be there for her.